Disclosure: This set was purchased with my own money. All opinions are my own. Amoralle has this way of creating beautifully seductive imagery. The Latvian luxury label's lookbooks are fairytale dreams. Even their studio product photography seems otherworldly. The last time I bought from the label was nearly 4 years ago. It wasn’t an entirely positive experience, and I had to cancel an order because it hadn't been shipped after several weeks. Yet enough time passed for me to want to give them another go. Even at up to 80% off, Amoralle's sale items are still expensive, but more-or-less affordable for me (rather than completely unattainable). I chose the ‘Sapphire Colour Sleepwear Set’ comprising of a babydoll and matching bottoms. The set originally cost 340 euros ($390). In the sale, I paid 110 euros ($126) plus 20 euros ($23) shipping. The size range for the set was S-L. In my experience, Amoralle sizing can be a bit hit or miss. Going by the size chart, I suspect M would be the best size for me in this design, but it was sold out. My previous order was a bit snug in size L, so I chose to go for the large and hope for the best. My priority with loungewear is rarely the fit. Design, fabrics and construction are my main concerns when it comes to these sorts of purchases. My order took around a week to arrive from Latvia to the UK. I was a little disappointed at the condition in which my order arrived. It was sent in a plain mailing bag with each of the garments in a clear, plastic polythene bag. The shipping method appeared to be a fraction of their actual shipping charge (using regular mail rather than a courier). Whilst I wouldn’t expect ultra luxe gift wrapping for a sale purchase, it would be nice to see a more appropriate shipping fee. 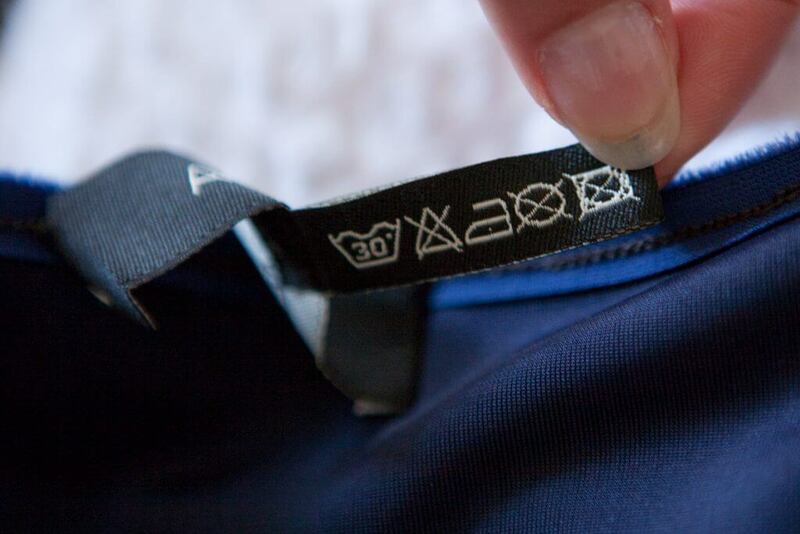 I was also concerned to see my garments had no swing tags or care labels inside. This is particularly noteworthy as there appears to be quite a discrepancy between the way items are described on the website and how they feel in person. The lack of fibre content label means there is no way to verify this. Amoralle 'Sapphire' babydoll set. Tassel details. My first impression of the garments was somewhat mixed. On the positive side, there are lots of beautiful details, like the volume of the skirt and the exquisitely voluminous tassel trims. You don’t fully get to appreciate these in the website photos. The colours are also particularly striking in the flesh, from the vivid blue of the velvet and satin to the delicate pink of the lace tulle. Amoralle 'Sapphire' babydoll set. Lace neckline detail. The babydoll's bodice is made from stretch velvet and satin and lined with a supportive, matte stretch Lycra. It's cut in a similar manner to a supportive stretch bra with an underband and 2-part cups, and is beautifully constructed. Features like seams being concealed inside a lining and fabric covered buttons are time consuming and expensive to execute, and a good indicator that this is a luxurious garment. Small, clear elastic loops are included at the underarms for ease of garment hanging. 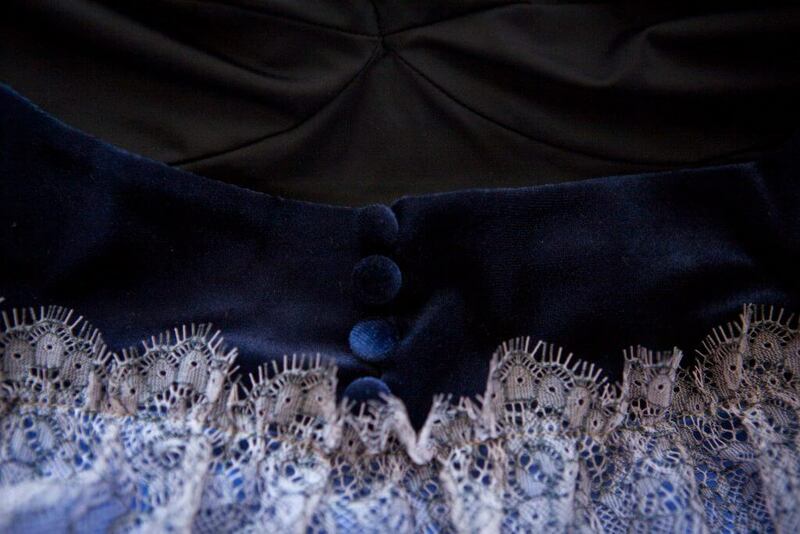 The garment fastens at the centre back with a series of elastic loops and velvet covered buttons. The neckline is trimmed with a triangular insert of scalloped Chantilly lace. Amoralle 'Sapphire' babydoll set. Bodice lining. At each bust apex are two pieces of satin cord: one is a standard shoulder strap and the other is loose and trimmed with an ultra-luxe heavy tassel. These loose cords can be wrapped around the body as you wish for some gorgeously graphic styling options. An oversized bow embellishes the centre front. It’s described as ‘citrine’ by the brand, but I’d say it has a slight green tinge. The bow is made from a bagged out (i.e. all seam allowances have been enclosed on the interior) stretch satin rather than a ribbon, giving it a luxurious weight. The bow shape isn’t fixed, which certainly makes life easier when washing and pressing this garment. The bodice underbust is connected to a voluminous, circle-style satin skirt with a cascade of ruched Chantilly lace below. (The lace has a ground of pale pink with black threads, though it’s difficult to capture the colour accurately in photos.) 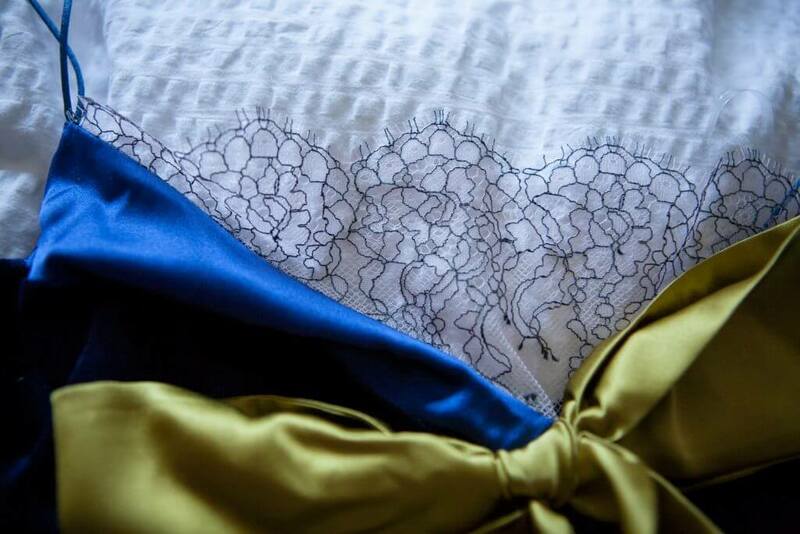 The lace is neatly lockstitched on with colour matched thread with the scallops having been pattern matched so well that it’s barely detectable. 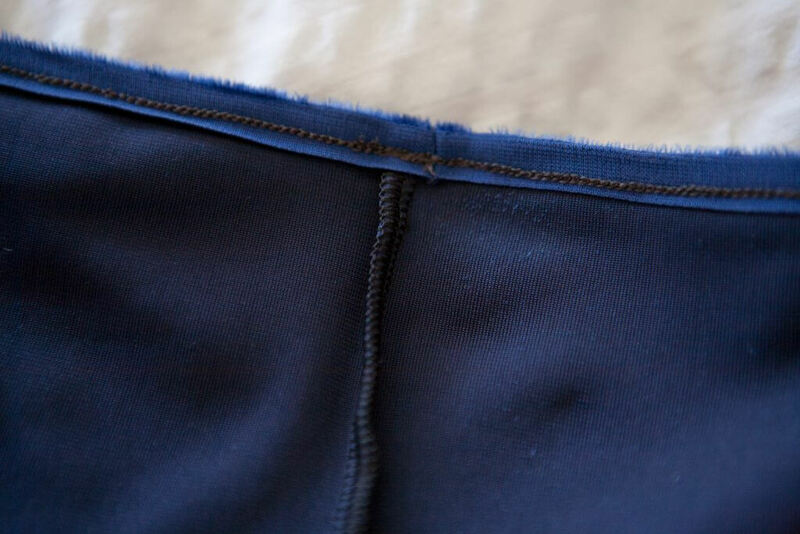 The skirt hem is finished with a lockstitched roll hem with no visible stitch errors. It’s a true circle skirt cut, with no vertical seams whatsoever. 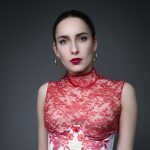 A circle skirt uses a lot of fabric and can incur a relatively large amount of waste, so it's a cut that is largely reserved for high-end lingerie. Amoralle 'Sapphire' babydoll set. Finishing on the knicker interior. The knickers are quite disappointing after the design feast of the babydoll. They’re a simple, high-waist brief made from stretch velvet. The side seams are overlocked. The waist and leg edges are encased in stretch velvet ribbon and chainstitched (a relatively cheap and quick construction method allowing for stretch without thread breaking). The gusset is lined in black cotton jersey. They’re unremarkable, and I don’t quite understand why they were included as a set. The babydoll design, in my eyes, has more than enough going for it to be sold alone. Amoralle 'Sapphire' babydoll set. Knicker interior labels. I assume both garments were made in Latvia, though there are no labels or tags included with the garments to verify. What disappointed me most about this set is the choice of fabrics. The website describes the main body of the babydoll as silk and this is definitely not the case. It feels like a much cheaper polyester and doesn’t have the breathability or flow of actual silk satin. Unfortunately, due to the lack of any fibre content labels on the garments, I can’t verify what the garments are actually made of. Perhaps it’s a synthetic/silk blend. However, to describe that as silk remains inaccurate. Certainly there are benefits to synthetic satins or synthetic-silk blends. They’re much easier to wash and dry, for example, and they don’t crease nearly as easily. Yet they don’t feel the same as a true silk. That breathability and softness is missing. For a garment at this retail price point, I can’t help but be disappointed by this cheaper fabric. Not only is the ‘top’ not pure silk, but the knickers are definitely not a thong cut. I’m also a little confused by the garter strap comment as the knickers came with neither garters nor garter loops for them to be attached to. I can’t help but wonder if information is being lost in translation from Latvian. The fit of the garments is pretty much what I expected. The combination of my body shape and the fact I purchased what was technically the wrong size for my measurements mean the garments don’t look the same on me as they did on the original model. The briefs are a good fit on the seat and hips, but are a little baggy on my natural waist. They rise to a couple of inches above my natural waist, which was a pleasant surprise as I have a longer than average torso. People with shorter torsos may find this cut comes up to their underbust. I usually wear a UK 12 (US 8), and the stretch in these knickers mean they'd comfortably fit up to a UK 14 (US 10). The babydoll is too big for me on the bust. Honestly, I suspect I could have easily fit into the size small. The only really fitted part of the garment is the bustline, and there’s plenty of room to spare on my 34" bust. Consequently, the bustline has a tendency to collapse on itself, and the lace trim at the neckline doesn’t lie flat like in the product photos. Initially, I thought the lace not sitting flat was due to the garment being too large for me, so I borrowed a larger-busted relative to compare. Unfortunately, even on a 38”/34D bust, the lace detail would still collapse on itself. The lace is too lightweight to hold any real structure, and although it can be laid flat for a photo, it simply won’t sit that way during actual wear. It doesn't personally bother me as a detail, but it is worth noting the difference between a brand's photoshoot fit and what you actually receive. The actual experience of wearing the babydoll is rather excellent. The full circle skirt gives the babydoll a rather delightful sense of movement (perfect for swishing, rather like one of my favourite Agent Provocateur sets). 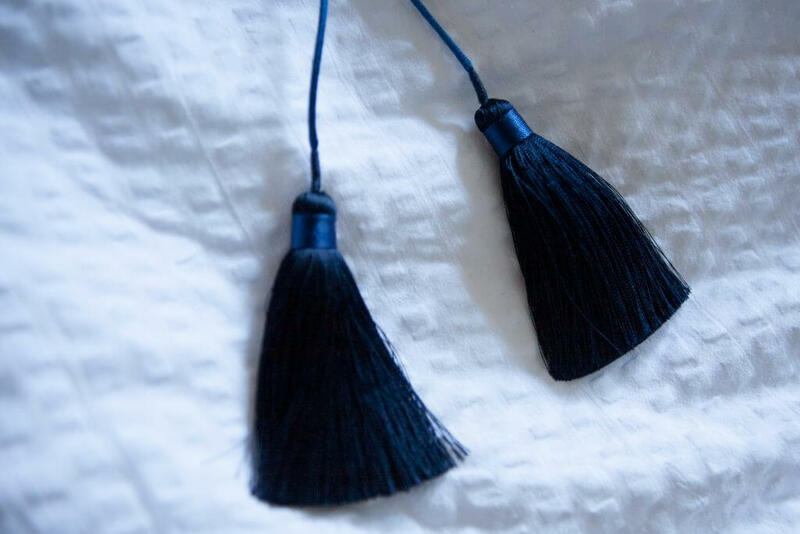 The decorative cords have lots of potential for decorative styling, and the end tassels are wonderfully fun! 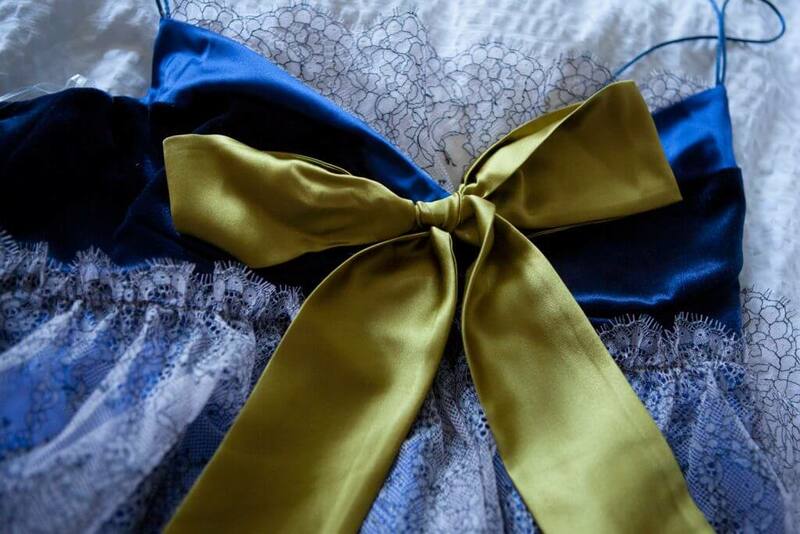 The oversized decorative bow at the centre front is fully functional, and can be tied and untied. The design is so over-the-top in the best possible way and is unlike any other brand on the market. It makes Amoralle’s fairytale lookbooks that much more appropriate. Quite frankly, wearing this babydoll made me feel like I should be on my way to a fancy party rather than lounging around at home eating snacks. Amoralle 'Sapphire' babydoll set. Bow detail. Even with all of the fit problems (caused both by cut of the garment and purchasing too big a size), this would ordinarily have been a garment I would have treasured and worn regularly. Sadly, it’s let down by the choice of fabrics. I personally don’t like to wear synthetic fabrics so close to the skin, especially not to sleep or lounge. There’s nothing explicitly wrong with the fabrics they chose to use, but they should have been described more accurately on the website. It’s also a problem to see a garment devoid of any fibre content information. Above a certain price point, I expect luxury lingerie to use true silk satin rather than synthetic blends. Alhough I suspect the lower cost of these synthetic fabrics is what allows Amoralle to have their decadent, fabric-heavy silhouettes. It’s unlikely I’ll be shopping with Amoralle again soon. Fabrics play a major part of my love for lingerie. While I will continue to admire their designs from a distance, I won’t have quite the same desire to wear them. Readers: Have you ever tried Amoralle? How important are the fabrics in a piece of lingerie to you? Thanks for this in depth review! I love how the babydoll looks. I love looking through the Amoralle lookbooks but I can’t help but feel that they really should invest in better translation services. English is not my first language but I can still recognize that their wording is often a bit off, which might contribute to the differences in “what you see/what you get”. Fabric lingo is HARD. I would hope that in the future they find a better translation service. As for the missing fabric tags – that’s a no go for me too. I’m super picky and I also really want to know what I’m wearing. And having something described as silk that is not – that’s fraud. Excellent review as always! This very closely reflects my feelings about Amoralle. I bought one of their robes in the sale and again, while I don’t expect the most luxury packaging for sale items, it still cost a fair chunk and I found the clear polythene bag rather galling on that basis. The robe is perfectly nice but doesn’t look quite like it did on the website. It also definitely feels like it’s made of relatively cheap materials. I’m reasonably happy with it for the sale price, and it fills a need in my wardrobe (as much as one can “need” floaty loungewear!! ), but I would have been incredibly disappointed if I’d paid full price for it. I agree. Amoralle’s product photos look so dreamy! Yet every blogger I follow who has bought from them has noted the colors are different in person. I contacted them once to ask about their use of “satin” on the web site, and they confirmed that the satin is a synthetic blend. However, this doesn’t explain why the items marketed as “silk”, not “satin”, aren’t real silk… I guess I’ll be combing pre-owned clothing sites to get a chance at the brand.